Our Premium Vinyl Windows are Energy Star certified, and include basic, standard features as well as full professional installation. 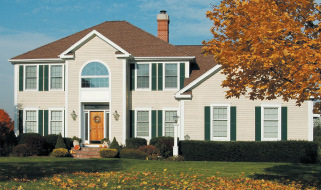 Numerous window styles are available to fit your home. Premium Vinyl Windows replacement windows, sold through Keystone Window of Pennsylvania, are by far the best value available. All of our windows are Energy Star certified, and have some of the lowest Air Infiltration ratings of any replacement windows in the industry. In addition, you will always know the cost of a window up front. No tricks, games, or hidden fees. What’s more, that cost we publish will always include basic, standard features, such as argon gas fill and low-e coating, as well as full, professional installation by our factory direct and Installation Masters certified installation crews. In addition, we offer a variety of window styles to suit your preference. Each of these window styles is available with numerous color options, from interior woodgrains to foil laminates to an unlimited variety of exterior color choices. You will not find a better value anywhere else!